The DN describes the contents of attributes in the tree (the navigation path) that will reach the specific entry required OR the search start entry. 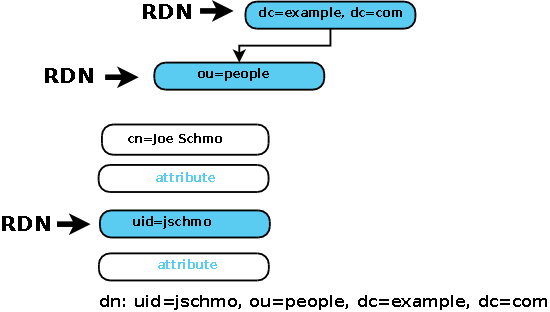 A DN is comprised of a series of RDNs (Relative Distinguished Names) found by walking UP the tree (DIT) to its root (or suffix or base) and is written LEFT to RIGHT unlike the file system analogy you see quoted everywhere which is written RIGHT to LEFT. The DN is written LEFT to RIGHT. When a new entry is added to the DIT a DN is used to tell the server how to structure (or place) the entry. An example of new entries being added is shown below as an LDIF file (they could equally have been added using an LDAP Browser or a specialised LDAP client tool). In general, it does not matter what attribute value is used to add a new entry as long as the 'dn:' is unique. 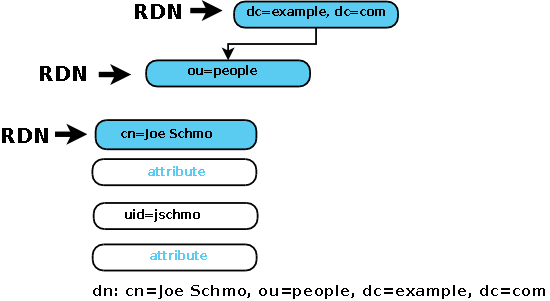 The above example has chosen to use cn=Joe Schmo in the last entry for this purpose. It could equally have been, say, uid=jschmo. LDAP searching can use any attribute or combination of attributes and can thus find entries irrespective of the 'dn:' value used to create the entry. To avoid excessive searching, in most cases it makes sense to use a 'dn:' value that represents an entry's most frequently used access DN. Thus in the above example is would be assumed that most directory access would use the cn= attribute. LDAP standards, somewhat confusingly, do not use any special terminology when refering to the DN used to intially create the entry. However, this 'creation' DN is sometimes - especially in the context of LDAP used within Microsoft's AD - referred to as a Principal DN, primarily due its use as a Principal (Security Principal) within Kerberos.